DISCLOSURE: I received free samples from Crowdtap to facilitate this post. All opinions are my own. 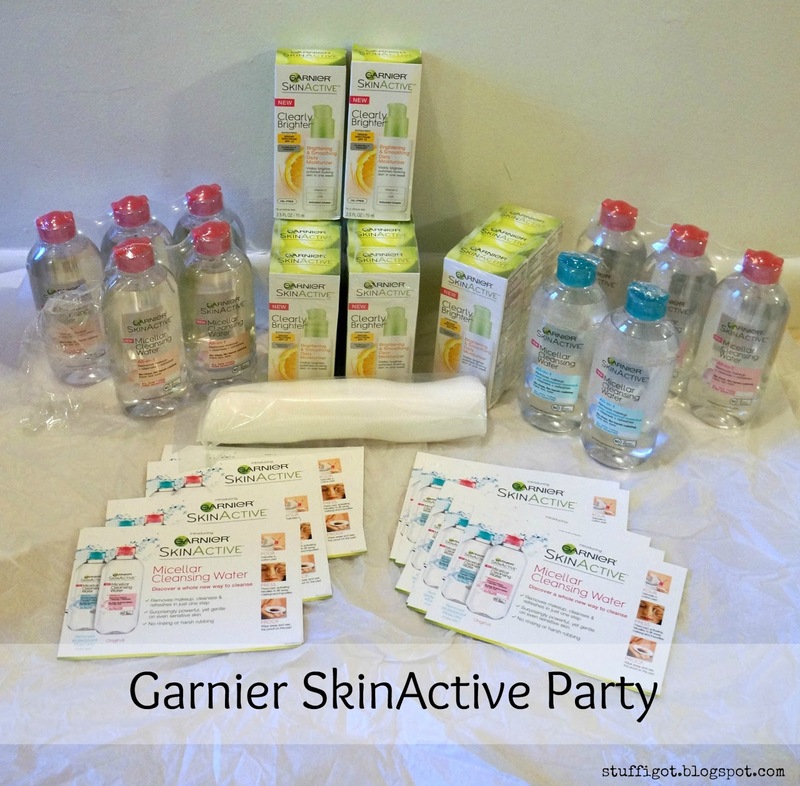 Recently, I had the chance to share some new products from Garnier Skincare with my friends and family, thanks to Crowdtap. I received the party package right before Christmas, so I thought it would be fun to bring it along to my sister's Christmas Eve party. 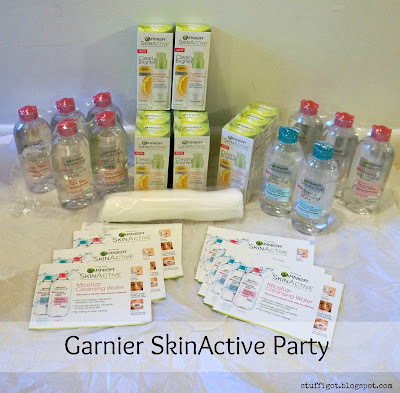 The party package included samples of Garnier SkinActive Micellar Cleansing Water (regular and waterproof) and Garnier SkinActive Clearly Brighter Brightening & Smoothing Daily Moisturizer. Both products were new to me and my party guests. 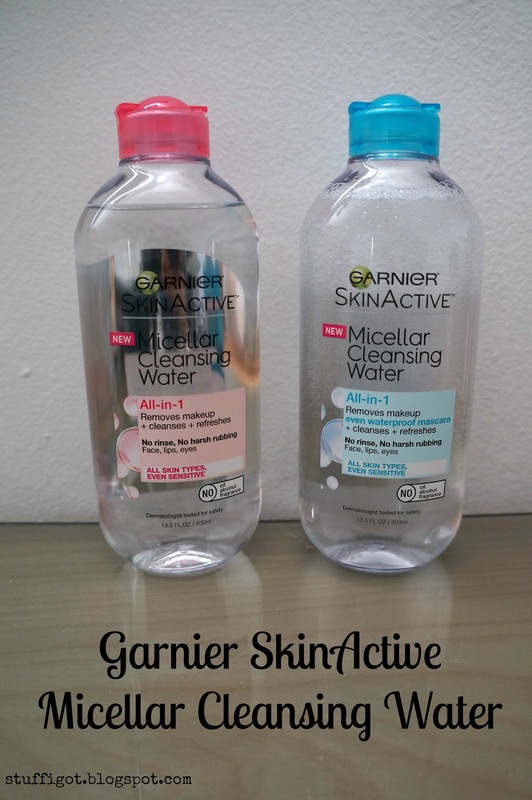 Some had heard of and even tried other micellar cleansing waters, but not Garnier's. 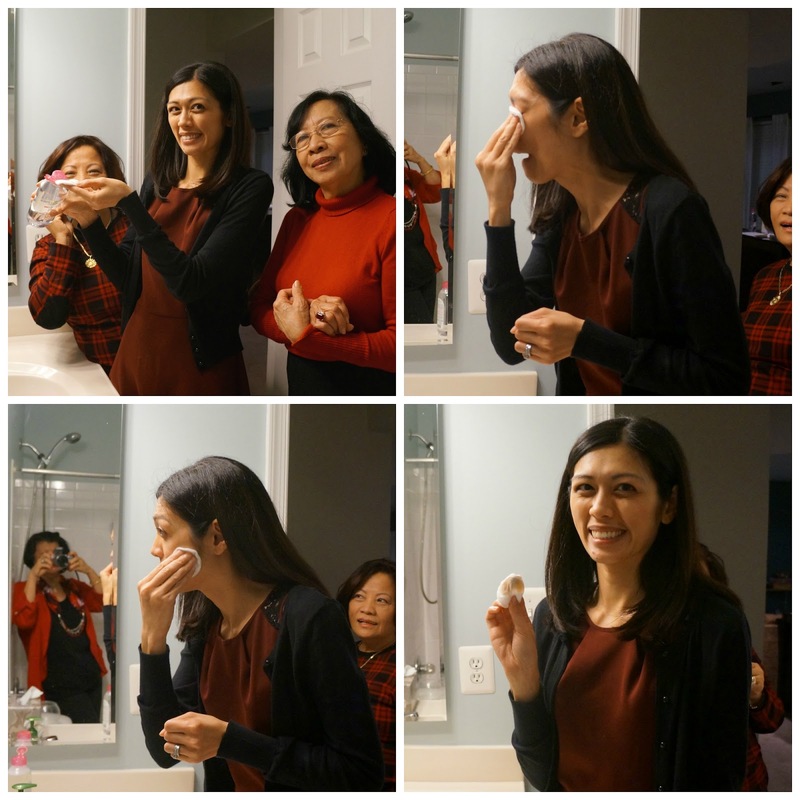 Everyone was pretty excited to try out the products and even more excited about getting to take some samples home! 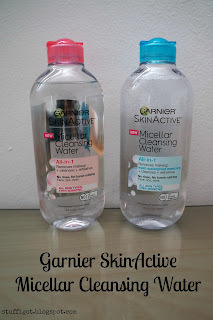 Garnier SkinActive Micellar Cleansing Water is an all-in-one cleanser that removes makeup and cleanses and refreshes your skin. It gently removes makeup without needing to rinse or harshly rub the skin. It features micelle cleansing molecules that pull oil and dirt away from the face. To use, you saturate a cotton pad with the micellar cleansing water. Press the pad to your face and hold to activate the micelles. The, gently wipe to remove makeup and dirt from your skin. We all liked the micellar cleansing water! It's gentle on the skin, but yet did a pretty good job at removing makeup. 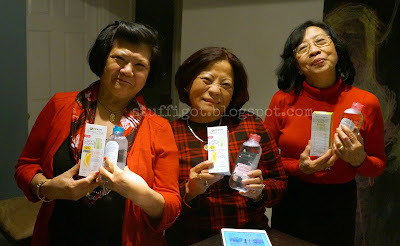 After using the micellar cleansing water, my skin felt clean and refreshed. I liked how it didn't leave any kind of residue on my face, like I've experienced with some makeup remover wipes. It did take a few cotton pads to completely remove all my makeup. I used two separate pads for my eyes and then another pad or two for my face. You can also use it on your lips, but usually by the time I'm taking my makeup, my lipstick is already long gone! Here are some pictures of me taking my makeup off during our party. None of my siblings or friends wanted to take their makeup off during the party! But, my Mom and Aunties were okay with it. My one aunt said it didn't matter, she was beautiful with or without makeup! Removing my makeup during our SkinActive Party. Since my Mom and Aunties were more willing to participate, they got first dibs on the samples! Garnier SkinActive Clearly Brighter Brightening & Smoothing Daily Moisturizer helps to provide visibly brighter and polished-looking skin in one week. The moisturizer is fast-absorbing and turns rough, dry skin into smooth skin with a more even skin tone. 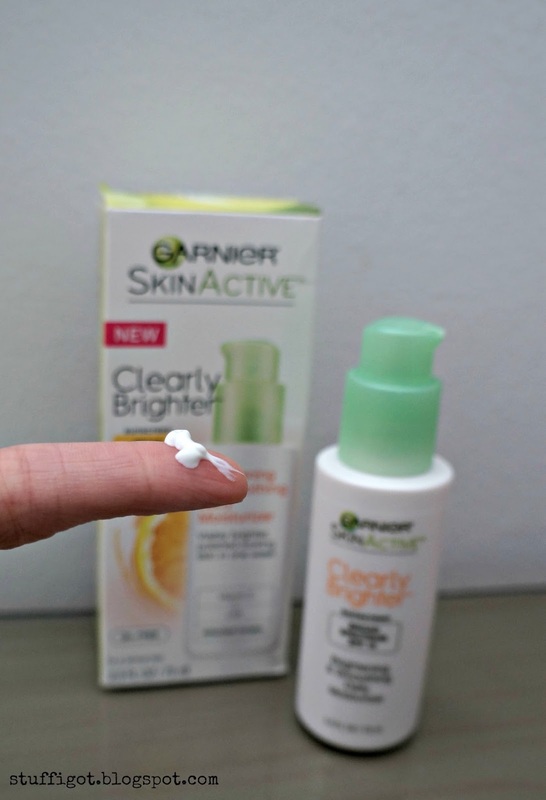 The moisturizer also provides SPF 15 sun protection. I really liked this moisturizer. My skin is usually so dry in the winter. After washing and toning my face, it feels even drier. But, after applying this moisturizer, my skin feels so much better. I've been using it now for a few weeks. And I do feel my skin looks brighter and somewhat smoother. I have been getting terrible breakouts over the holidays (which may be because of stress), but I haven't had any in the last couple weeks. I like that it doesn't leave my skin feeling greasy and that it provides some sun protection. Overall, I'm pretty happy with both of these products from Garnier. I'm definitely planning on picking up more micellar cleansing water when I run out. I'm usually so bad at taking my makeup off at night. But, the micellar cleansing water makes it so easy. Even if I'm feeling lazy, it doesn't take long to wipe off my makeup with the cleansing water right before I get in bed. The SkinActive Micellar Cleansing Water and SkinActive Clearly Brighter Brightening & Smoothing Daily Moisturizer are available now to purchase in stores or online. The cleansing water retails for $8.99. The moisturizer retails for $14.99. 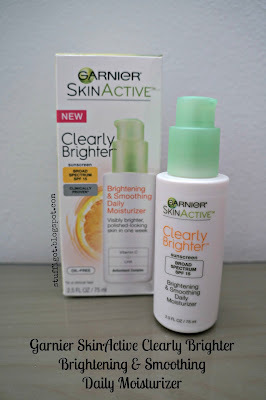 Love the Clearly Brighter lotion too, it smells good and its good to wear daily for the daytime outside!